This week we have had the embarrassment of our third ranked government minister Gerry Brownlee making derogatory and inaccurate statements about Finland and then laughing it off, claiming it was meant in a humorous or satirical way. "In the general debate last Wednesday, the Cabinet minister began by attacking the Labour Party's admiration for Finland, but his monologue ended with him attacking Finland itself." Mr Brownlee, who holds several posts including Leader of the House, said Finland had higher unemployment, lower growth and worse crime than New Zealand. He added that Finland can hardly feed its people and has little respect for women. The comments have been reported heavily in the Finnish media and a page on the social networking site Facebook has been set up calling for him to travel to Finland to learn some facts." It also reached the Egyptian media. After the issue reaching media in Finland as outrage grew, a Finnish university lecturer started a Facebook group and the Finnish embassy called for a "please explain" from our Ministry of Foreign Affairs and Trade. John Key has apologised Brownlee's comments when meeting Finnish President Sauli Niinisto in South-Korea! However let's look at the context. I caught the last of this interchange in Parliament last week when the Government and Opposition were in full attack mode over the issue of the Finland economy. On Facebook one man pointed out that this was one of those inevitable results of an outdated and archaic parliamentary system of opposition. On Facebook one man pointed out that this was one of those inevitable results of an outdated and archaic parliamentary system of opposition. Yes, our adversarial parliamentary system sets the scene for this to take place. I hope someone in Parliament will now take the initiative on Parliamentary reform. Joking and jibing across the chamber increases and leads to this gaffe. No amount of talking will pass it off as satire or a joke now I am afraid. When the two major parties face each other and yell abuse at each other it is embarrassing to be in the gallery. I have just watched a bit of a debate on a social welfare bill. Grant Robertson of Labour responded to the Minister's speech, then a government MP read his prepared speech, making absolutely no mention of the critical issues Grant Robertson had raised. This is like kindergarten children talking to each other in parallel conversations, hardly good enough for our prestigious parliamentary representatives to dignify with the term 'debate'. So much of our taxpayers money is wasted. 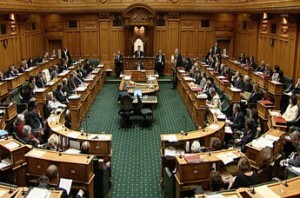 Electoral reform changed parliament, with the exception that Government and the chief Opposition still sit opposite each other and throw insults to those "on the other side". Not good enough for the 21st century.